Happy Halloween from Chickadee Gardens! Halloween and this time of year grabs at my heart strings, revealing magic that hides under the guise of more cheerful months. I find Nature illustrates this magic better than any plastic lawn Frankenstein so in that spirit, let's take a tour around the green and orange things at this time of year to see if we can catch a glimpse of magic. On top of Mt. 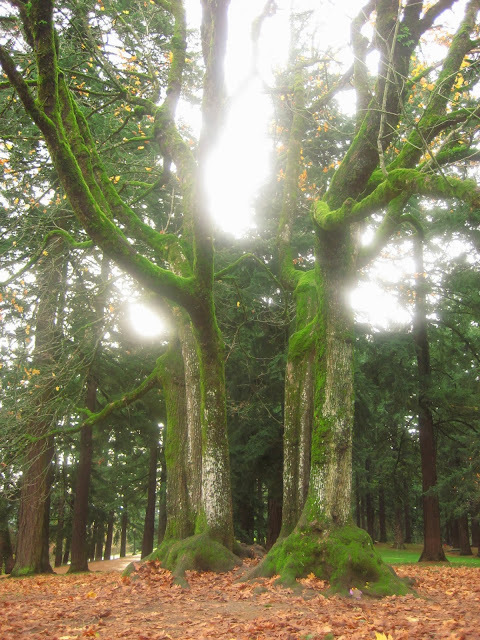 Tabor in my neighborhood stands a mighty big leaf maple tree, the one I call "the highest point in Portland". Whether or not that's the case, it is a mysterious tree with double trunks. Or maybe it's two lovers standing together to guard the lands below. Mt. 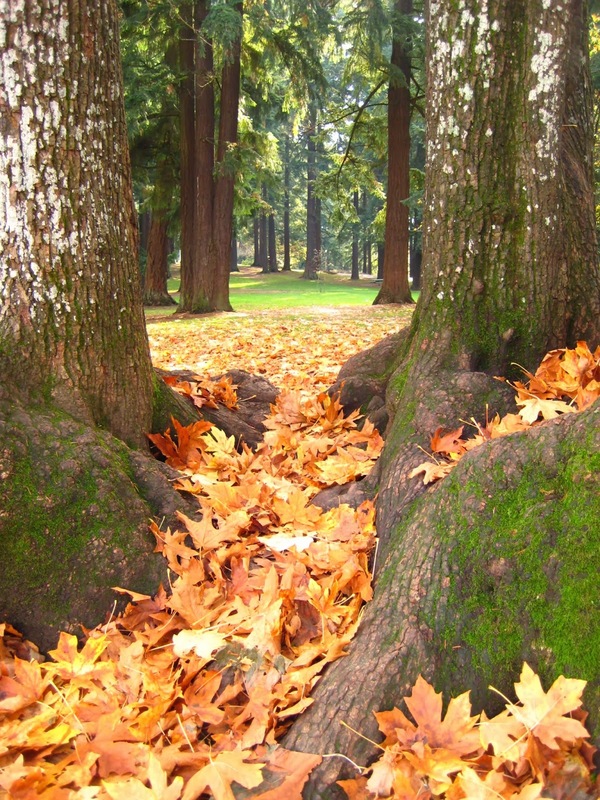 Tabor often has gifts left by fairies. OK, this is not in Portland - rather in Mexico City, or DF, at the Frida Kahlo Casa Azul house. A shrine to her and Diego. How's that for a color combination? Wow, electric! What Portland Halloween is complete without a trip to Sauvie Island? It's a must-do, plus that's where Cistus Nursery lives. Two for one! At Casa Azul in Mexico City. 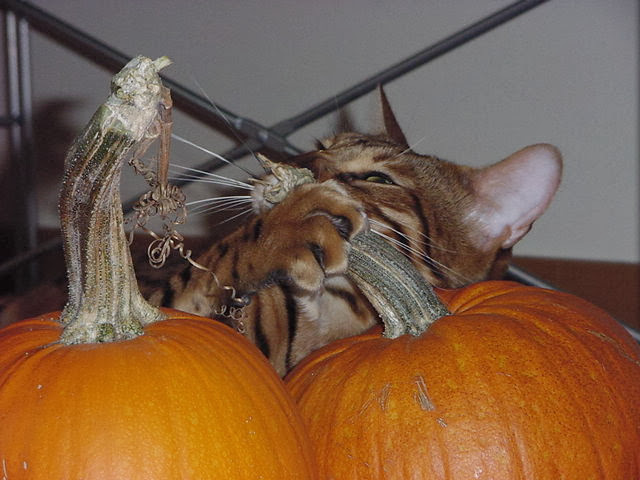 Hobbes celebrates Halloween by eating pumpkins. Such perfect pumpkins! Leave it to Portland Nursery. The guy making the cider at Portland Nursery was bored. I like his creativity! Our not so perfect pumpkins, but full of character. I love the face my husband carved on this guy. So cheerful, like him! Thus ends our tour of orange and green (and sometimes scary) things. I hope you all have some magic in your day, green, orange or otherwise. Happy Halloween, Samhain, Autumn, everybody! May the Great Pumpkin choose your pumpkin patch this year! Boo! So many wonderfully seasonal images! I love all the orange. Happy Halloween! Thank you Alison! We are particularly fond of orange around here! Happy Halloween! Happy Halloween (belated)! Hobbes is so gorgeous! Happy Halloween to you all too! What a beautiful, festive collection of photos! I'll enjoy your fall foliage from afar, as we have none of that here in Austin, at least not yet. Pam! Thank you so much for visiting my blog! You are on my list of favorites and I really appreciate all the time and energy you put into the gardening world. Thank you! Yes, we do have lots of fall color here, we've been spared any major deluges this fall so the leaves are especially lovely. Your fall photos are so gorgeous, I especially like the neighborhood tree that has such brilliant foliage.